Overall, a pretty darn good day. Gold was up 1.39%, or $24.30 to $1,777.60. Silver was up $0.67 to $34.66. Gold has now breached resistance at $1,775. Let’s see if it can hold it through Friday’s close. Silver is still hovering just below its resistance at $35. Jim Sinclair published the following article on Thursday. There are two topics that stand out. First, he will inform his followers to know when gold has peaked. Of course, so shall I. Second, he not only expects to be right in the first instance, he also expect expects his corporate success will equal his success in calling the top in gold. He is referring to his gold company, Tanzanian Royalty Exploration (TRX). My faith in Jim Sinclair runs deep and Susan and I have all of our mining share dollars (other than a tidy sum in a private placement with Doug Casey and Olivier Garret) in Jim’s firm TRX. I believe that the most important factor to consider before buying sock in a mining company is management. My view is simply if Jim Sinclair can’t pull it off, who can? TRX has done very well for us this year! Major accomplishments, without self-realization, is a total life waste. Accolades, in truth, mean nothing. Don’t you think knowing publicly that QE to Infinity was unavoidable years ago, and suggesting preparation for its colossal impact on economies for more than 10 years ought to get you say, a gold star? Nay, only the good old boys from Skull and Bones get such recognition. So far I have been privileged to have the best two market expectations possible in the history of markets, and the net result is if I charged for JSMineset, I might have five readers. When we call full valuation of gold correctly, we will be forgotten forever. It could be that what you give away has only the value people pay for it. A conservative group in New York that I spoke for last year discussing all that has occurred did not invite me back to speak this year. On a March 2009 Bloomberg radio interview I called the bottom of the bear equity market within two weeks and gold’s trip to $1650. That guarantees you will never hear from them again. I owe you two more accomplishments. First a corporate success of the same caliber and then full valuation on gold. Assuming that I pull these last two major efforts off, and I know I will, then I will say goodbye to markets and company building forever. I am sure Bert and Jesse are proud of me. 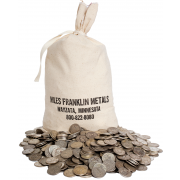 Regarding the topic of mining shares – there are three of us who write for Miles Franklin. I am the owner, and I do. Ranting Andy Hoffman does and so does our recent affiliate Bill Holter. One thing that I insist on here at Miles Franklin is that every one of us has an obligation to write what we believe and our opinion does not have to fall in line with what the other writers are saying. Ranting Andy is death on mining shares and with good reason. His personal experience in the industry and as an investor has left him with nothing but disdain and frustration with the sector. Bill Holter also worked in the industry and he is quite upbeat on the future of mining shares. He also says you should first have a very substantial core position of physical gold and silver and then you can use the shares as a high risk-reward investment that is leveraged to the price of the physicals. My views are similar to Bill’s. But I lean even heavier toward the physicals. Currently, my mix of physical to mining shares is 90-10. Eight years ago my mix was 50-50 and I made a great deal of money on the shares, which I then used to buy more physicals, for free. Interestingly, when I mentioned this to Bill, he said that was exactly what he did too. We all think we are right but thinking it and being right are two different things. So read what each of us has to say and as always, think it through and make your own decision. 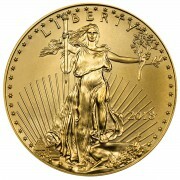 The one thing we all agree on is that you must have a large core position in physical gold and silver. Beyond that, whether you own no mining shares, some or a lot is up to you. 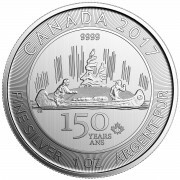 For me, I expect to increase the percentage of mining shares in my portfolio over the next six months, but remember, I already have all the physicals I will ever need, and they are safely stored offshore our Miles Franklin International Precious Metals Storage Program in Canada. Just got a note from Ranting Andy. It finally happened! Gold, priced in euro has just hit a new all-time high. So too will the dollar, but we might have to wait a few more months. Laura, our editor slipped this in our e-mail newsletter yesterday, with little fanfare, but I want to call it to your attention. This is a new chart I asked her to compose for our readers. 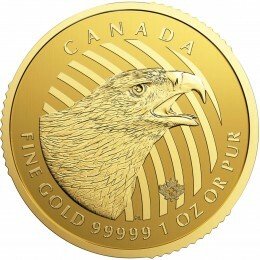 It compares, in easy-to-follow format, where the price of gold is at the close of each day, compared to one-year ago. As you can see, up until recently, gold was falling way behind its previous year’s performance. But now the tide has turned. It is rapidly moving ahead of last year and rest assured; gold will finish the year WAY ahead of last year’s close in the mid $1,550s. Just got some very important information from Deepcaster. You may recall that last summer I posted comments from James Dale Davidson that warned of the impending loss of the Dollar’s Petro-Dollar status. This is war on an economic level and threatens our very cushy lifestyle here in America. Do not take this trend lightly! China announced on Sept. 6, 2012 that any country that wishes to sell Crude Oil using its currency, the Renminbi, can do so. The next day Russia announced it will sell China all the Crude it wants and will not expect to be paid in $US. These actions struck a Mortal Blow, whose consequences are not yet fully evident, to the US Dollar as the World’s Reserve Currency, and thus to the future Economic Health of the U.S., a blow which will eventually impel it toward Third World status. Formerly a main source of strength of the $US was the arrangement with Saudi Arabia whereby Crude would be sold only in US Dollars. Since the World had to have Saudi Crude, it had to have $US. Not so anymore. China and Resource-rich Russia are ascending economically while the US and Western Europe are in a decline. Couple that New Power Reality with another New Reality, the accelerating decline in Purchasing Power of the Main Fiat Currencies, the $US and the Euro. Jim Sinclair: I was very sad reading your comments of 9/27. Obviously everyone was like me and read what you wrote, followed your thoughts, applied your thinking to their investing and NEVER REPLIED TO YOU to thank you or to just pat you on the back for your help in their most favorable investments. I AM SORRY that I for one did not take the few minutes to jot you a note. You have given me the courage to stay tight when the waters were rough and I am in a very comfortable position today because of you. Thank you very much.